FORMER GARDA COMMISSIONER Martin Callinan has told the Disclosures Tribunal that he has told the truth about his interactions with two TDs, a journalist and the Comptroller and Auditor General, despite their evidence he disparaged Maurice McCabe to them. He said that he found it “disconcerting” that a number of parties making allegations against him discussed these matters prior to the setting up of the Tribunal and added that he “found it strange” that some waited for a period of time to come forward with their claims. It was put to the former commissioner that he had “spun a web of lies” with his evidence, but he denied this. He also denied having a “personal vendetta” against Maurice McCabe. Callinan was giving evidence for a third day at Dublin Castle this morning, where he faced cross-examination from a number of parties. David Taylor, the former head of the garda press office, has made a protected disclosure that he was ordered by Callinan to conduct a smear campaign against McCabe in the media. Furthermore, RTÉ journalist Philip Boucher-Hayes, Fine Gael TD John Deasy, Fianna Fáil TD John McGuinness and Comptroller and Auditor General Seamus McCarthy have told the Tribunal that Callinan made negative comments about McCabe to them. The claims of these four parties cover the time from late December 2013 to January 2014. The latter three men listed claim that Callinan made the comments to them on the same day. It was put to Callinan today that these men were independent of each other, and were giving a truthful account of what the former commissioner said to them. It is Deasy’s account that Callinan “warned him” about McCabe. McCarthy alleges Callinan told him about the 2006 sexual abuse allegation against McCabe and said the whistleblower was not to be trusted. Boucher-Hayes says that Callinan told him McCabe had done “horrific things”, while McGuinness alleges that the former commissioner called the whistleblower a “kiddie fiddler”. That is not true. I’ve already indicated what I said to them. I’m here to tell the truth and I have told the truth. Certain issues have been misinterpreted by those parties. Particularly referencing McGuinness’ allegations, Callinan described them as “crazy”. 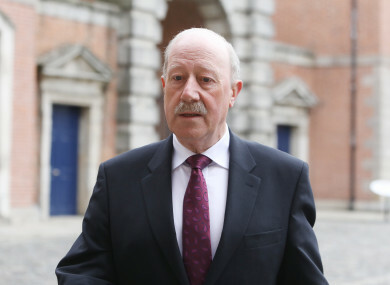 Callinan also said that he had concerns over how the allegations that have been made against him were discussed by some of the parties involved. The Tribunal has already heard that the trio of Maurice McCabe, Dave Taylor and John McGuinness all met each other on a one-to-one basis prior to the setting up of the Tribunal in February 2017. Callinan said today that he found it “disconcerting” that these matters had been discussed. It was asked if Callinan was suggesting that McCabe ”put McGuinness up to telling lies about [him]“, but he denied that was the case. It was put to Callinan that these matters weren’t under the terms of reference for that particular commission in 2015, but he did remark it was “strange” that these matters weren’t put into the public domain until McGuinness told the Dáil in May 2016 of the car park meeting in January 2014. Under cross examination by Darren Lehane SC, for John McGuinness, Callinan said it was “safe to assume” that he and McGuinness were “locking horns” over the Fianna Fáil TD’s desire to address the issue of penalty points at PAC. Callinan was asked directly by Lehane: “Why would Deputy Deasy make it up?” Callinan replied that he didn’t know. On the exact claims of McGuinness – regarding the “kiddie fiddler” at the PAC hearing in January 2014 and the car park meeting the next day – it was put to Callinan that because he kept no note and didn’t tell anyone the contents of the conversations, his account of what happened was inaccurate. It is McGuinness’ assertion, for example, that Callinan told him that McCabe had sexually abused members of his own family. Callinan denied this, and said his account was the correct version. “This is my evidence under oath,” he said. Lehane also put it to Callinan that he has “spun a web of lies” with his evidence and has attempted to trap McGuinness in that web. Callinan replied that this isn’t the case. The issue of McCabe’s whistleblowing was also put to Callinan this morning. McCabe, over a number of years, had raised issues ranging from policing in Cavan/Monaghan to the penalty points issue. Although an internal garda review upheld many of his complaints into Cavan/Monaghan policing, a circular was sent out to garda stations in the area by then-Chief Superintendent Rooney commending the behaviour of gardaí. Rooney has already told the Tribunal he regrets the contents of that circular. It was the assertion of McCabe’s counsel Michael McDowell SC today that this circular left the impression that “McCabe was left vilified in this way as a crank”. Callinan said he didn’t give the order for his office to stand over this circular, and that he may have been away at the time. He said he had no problem with McCabe making any complaints he had but that it was “understandable” if some colleagues took exception to what the whistleblower was doing. He said: “I took a very fixed position that it was inappropriate what was happening. Printing off Pulse records and passing them on to third parties. I took a very serious view. Clearly it was wrong. In ordinary circumstances, there would be disciplinary action. I balanced it with McCabe’s view he was highlighting wrongdoing. Email “'How could they have come up with that?... You very seriously disparaged Maurice McCabe to their faces'”. Feedback on “'How could they have come up with that?... You very seriously disparaged Maurice McCabe to their faces'”.